Anyway, Friûl (the ancient name) is home as well for a religious, cosmogenic theory of belief and energy, developed in the 16th century by a miller called Menocchio. 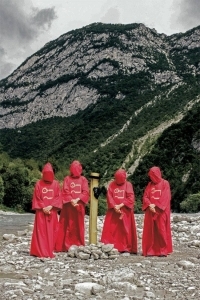 That cult was based on the presence of four spiritual entities that lived among the rocks and rivers of the region. The word ‘Qdor’ refers to a hermaphroditic being, worm-shaped and white, living in curdled milk (no kidding), and Menocchio referred to it as a metaphorical comparison, if you want to, for Chaos that created a cosmic order, symbolised by angels / archangels that represent love, light, salvation, knowledge and a peaceful state of mind. The worms that live in rennet are like the remnants born from Chaos, that stand for tranquillity, rest and peace, seen in both a global part of existing, as well as in search of the inner eye (the ‘I’ as a conscious being). A couple of years ago, some same-minded Italian (human, I guess) beings decided to start a project called QDOR in order to have this cult reborn. They wrote and recorded some compositions, and eventually it has been compiled and released via Italy’s Old Europa Café, a ‘free thinkers society’ that does not express politic or religious ideologies, despite some negative reactions of some narrow-minded people on our beloved Mater Terra. This fantastic and unique label, run by a sympathetic Frater, did release this material in two original packages, the first one being one that includes a three-track cassette (red tape), yet also a hand-bound sixteen-page ‘bible’ and a talisman, released in a handmade cotton bag with the band’s symbol; the Devote Edition. There is an edition as well that also contains a white tape with a fourth ‘song’ on it besides the red cassette, a wooden handmade rattle-instrument, and that ‘bible’ though with an eighty-four-page booklet. All this comes in a wooden box that one can use as a personal altar (the so-called Superior Edition, extremely limited and quite expensive). It recollects the aim of the cult, created for initiation, constructed this specific way for adepts, not ‘just’ listeners (though I will come back on the sonic side quite soon, evidently). The white tape comes with the bonus track La Via Dei Fiori (The Way Of Flowers), clocking nearly half an hour. It mingles the better elements of Deep Drone and Noise (not of the Harsh Noise or Noise Wall kind, yet rather the transcendental and hallucinoid approach), with inclusion of field recordings and samples, industrialised sounds and horrific aspects. At about five minutes, everything turns darker, more oppressing, more abyssal, with those screeching droning melodies, adding that overwhelming feeling of hopelessness, loss, emptiness, melancholy and helplessness. It’s so beautiful, so full of magic and mystery. Just over one third of this exceptional piece, terrifying sounds join the feast, and that combination – scraping guitar screeches and semi-fairylike melodies – is quite unique. Step by step the noises take over the leading role, turning the second half into quite an experimental collage of Horror-Drone and schizophrenic Industro-Noise.